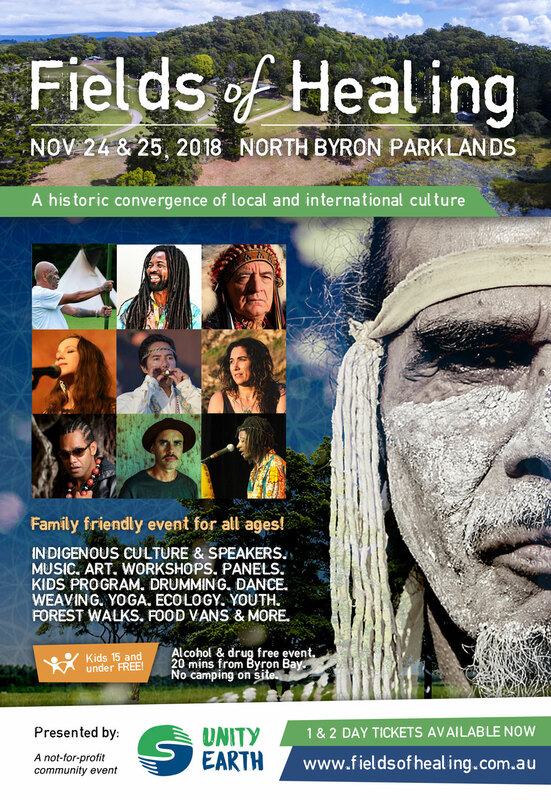 Indigenous Culture & Speakers, Live Music, Workshops, Panels, Art & Weaving, Dance, Drumming, Food Vans, Healing Pods, Yoga, Kids Space, Forest Walks and More! 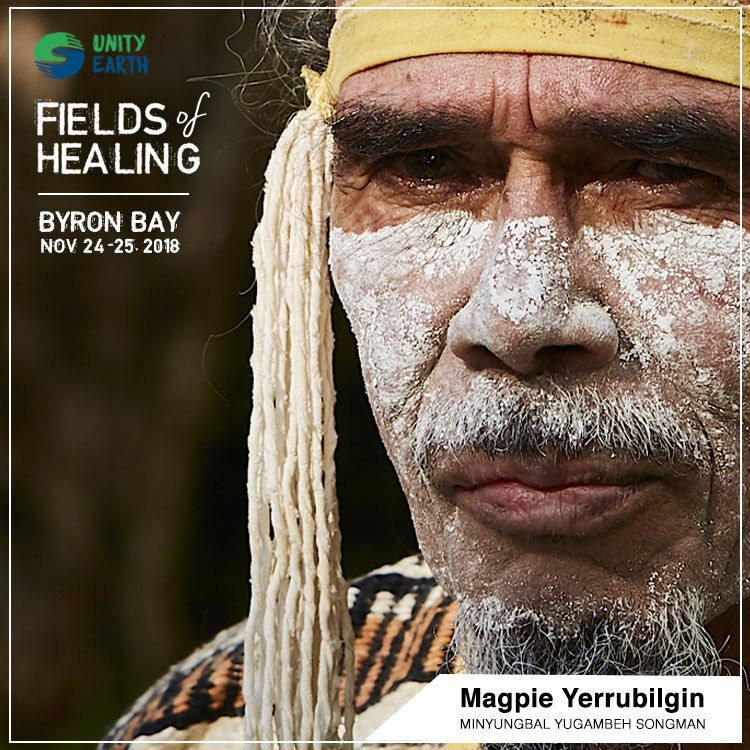 Indigenous leaders from across the globe will converge in Byron Bay for the first ever Fields of Healing on November 24th and 25th. 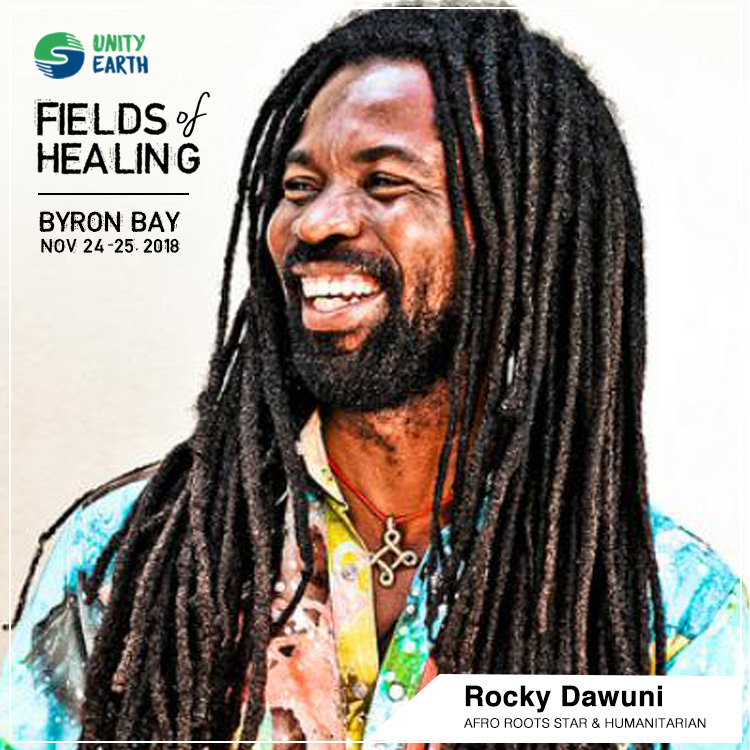 Presented by Unity Earth, this historic family-friendly gathering will be a powerful celebration of cultural diversity and unity through music, art, workshops, performance, ecological healing and much more! 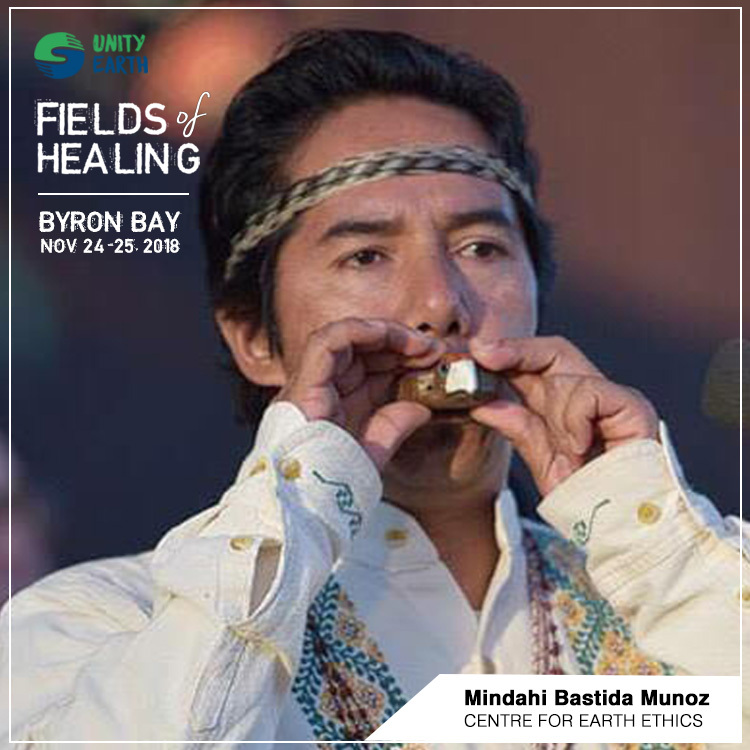 Guided by Minyungbal Yugambeh songman Magpie Yerrubilgin, Fields of Healing will welcome Hereditary Dakota Chief and Global Unity Activist Chief Phil Lane Jr, Maori wisdom keeper Louis Te Kouarehua Kereopa, as well as Dr. Mindahi Bastida, Director for the Original Caretakers Program at the Centre for Earth Ethics. 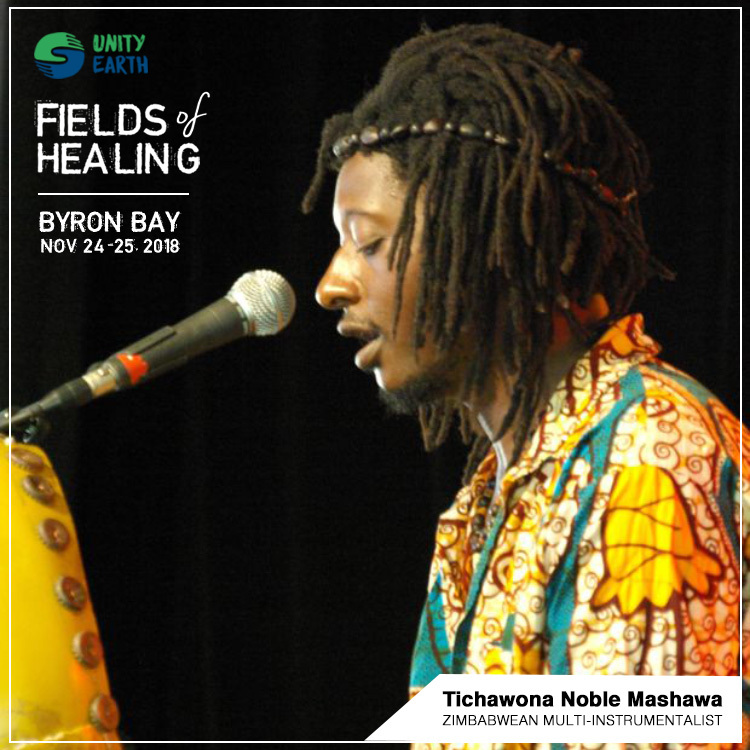 Featured musicians include GRAMMY® Nominated afro roots star and UN Goodwill Ambassador Rocky Dawuni, Zimbabwean multi-instrumentalist Tichawona Noble Mashawa, angelic vocalist Kristin Hoffmann with Premik Russell Tubbs, plus Indigenous roots musician Dane Kennedy, Irish/Aussie songwriter Aine Tyrell, and soulful Indigenous singer Keely Eggmolesse. 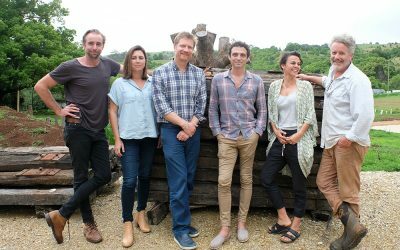 Join us at The Parklands! 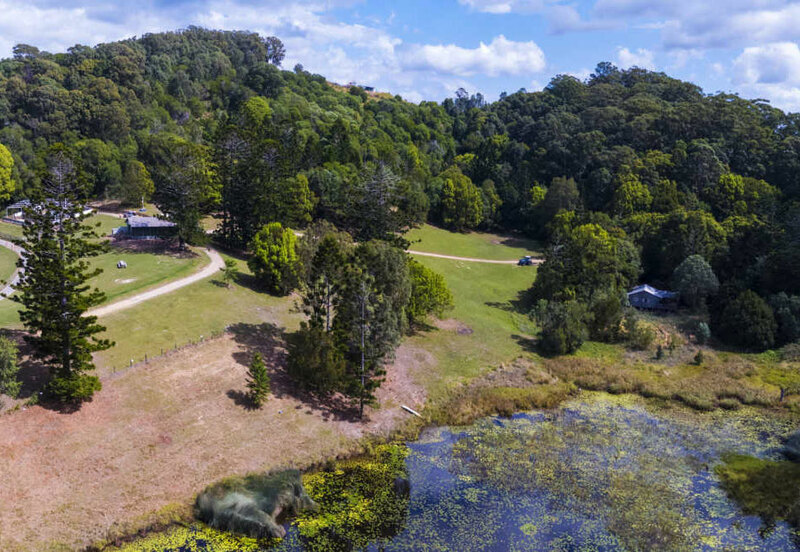 North Byron Parklands is a stunningly beautiful 660-acre cultural arts and music events venue 20 minutes from Byron Bay. 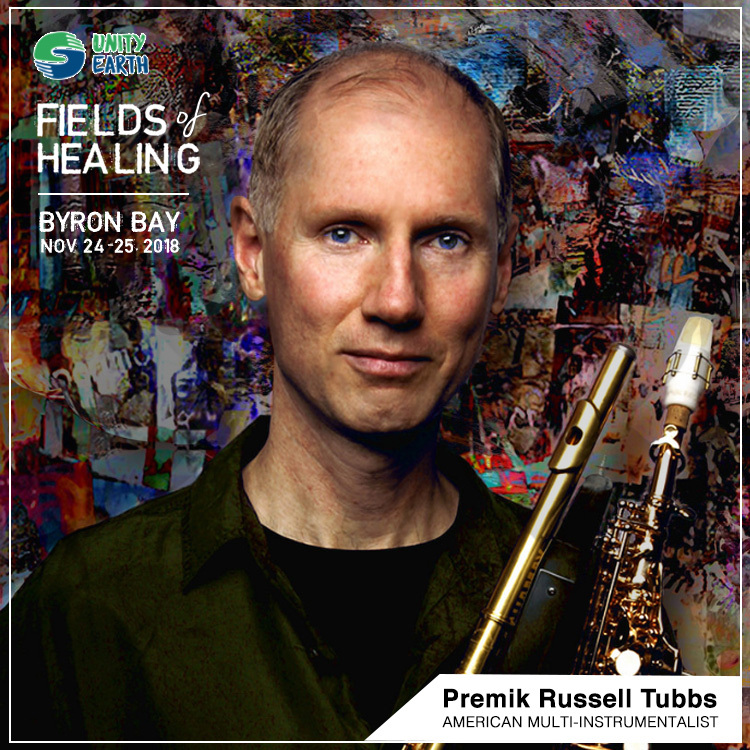 The two-day event is designed as both a “gathering” and a “retreat” offering an intimate experience capped at 1,500 people to ensure intimacy of attendees and delegates. 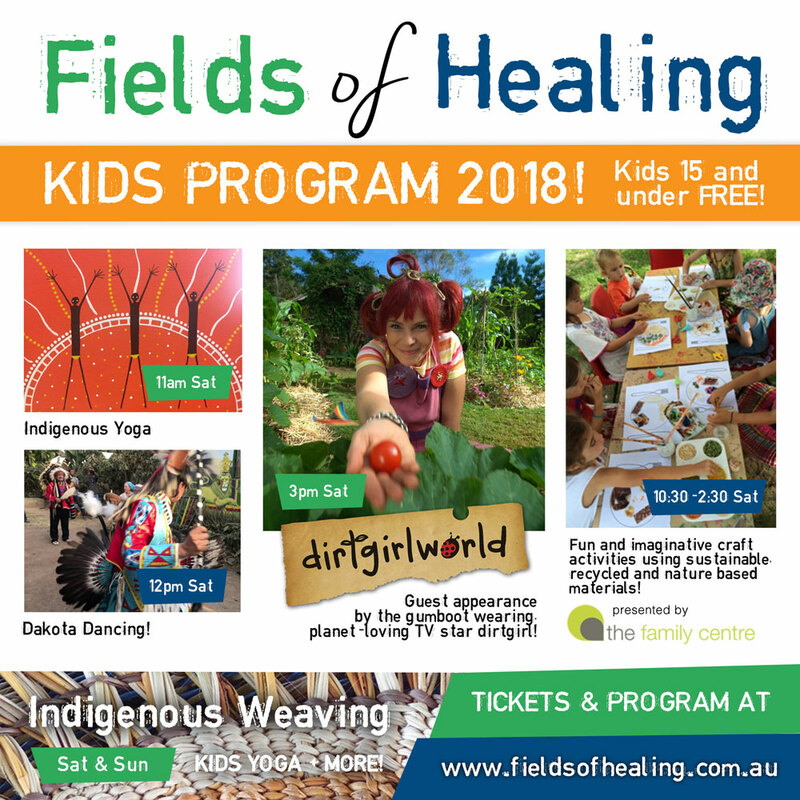 Our kids program will be headlined by the gumboot wearing, planet-loving dirtgirl from dirtgirlworld who will be bringing her grubby fun & joy at 3pm on Saturday afternoon! 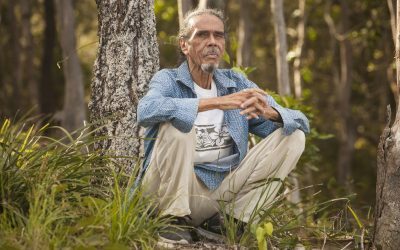 The Family Centre will be providing fun and imaginative craft activities for all ages using sustainable, recycled and nature based materials that make our imagination grow and keep our planet happy! 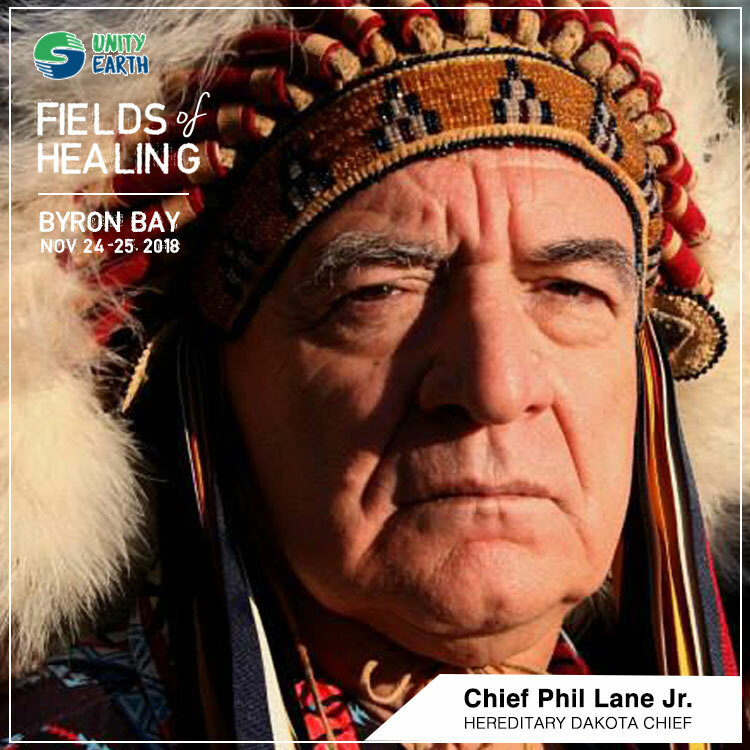 We will also have Indigenous Yoga, Native American Dancing, Yoga and Mindful Meditation for Kids, Indigenous Weaving and more! 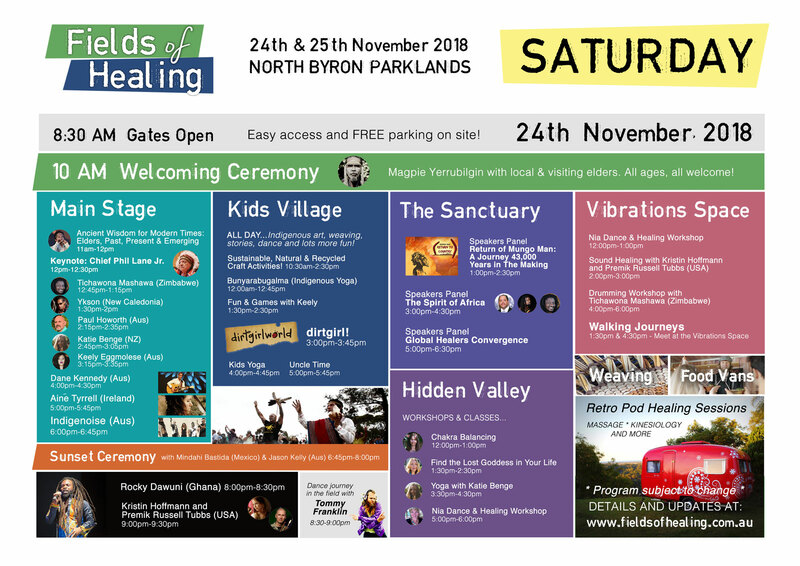 HEALING VILLAGE, WORKSHOPS & FUN FOR THE KIDS! 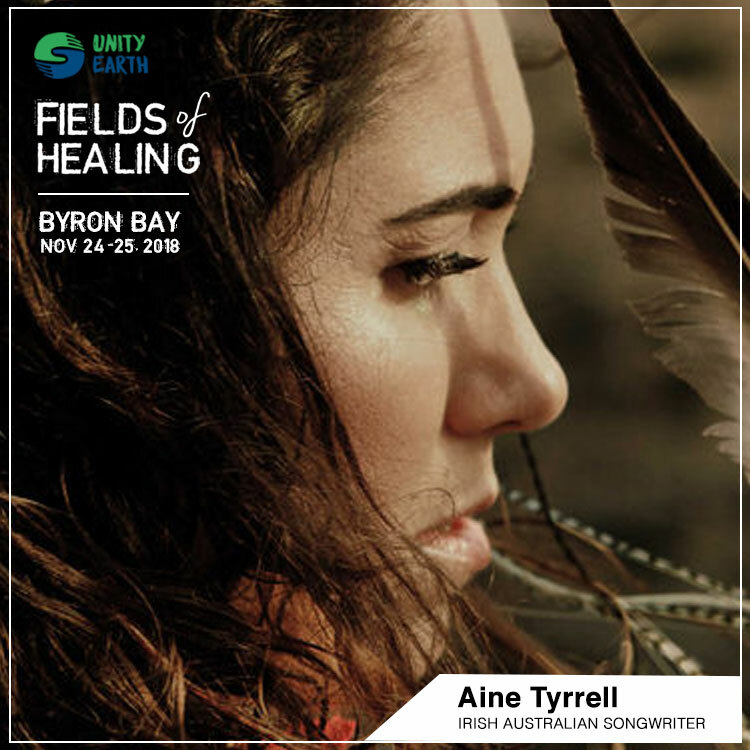 Fields of Healing will feature an exciting array of workshops and activities, as well as Healing Pods with massage, kinesiology and other practitioners offering free sessions on Saturday and paid sessions on Sunday. 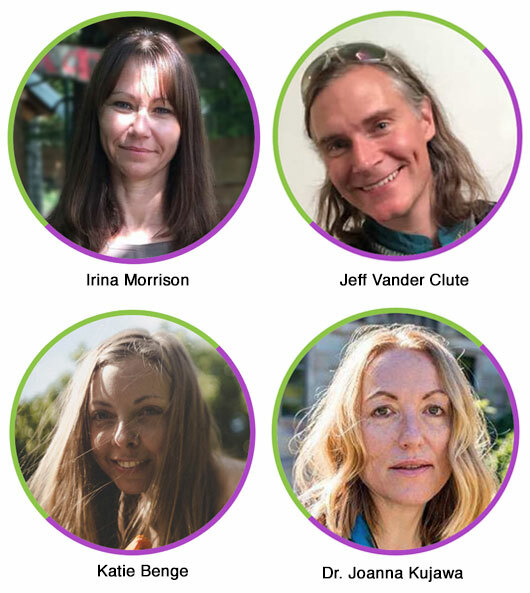 Yoga for Kids * Uncle Time for Kids * Mindful Meditation for Kids * Dakota Dancing for Kids * Plus more TBA! 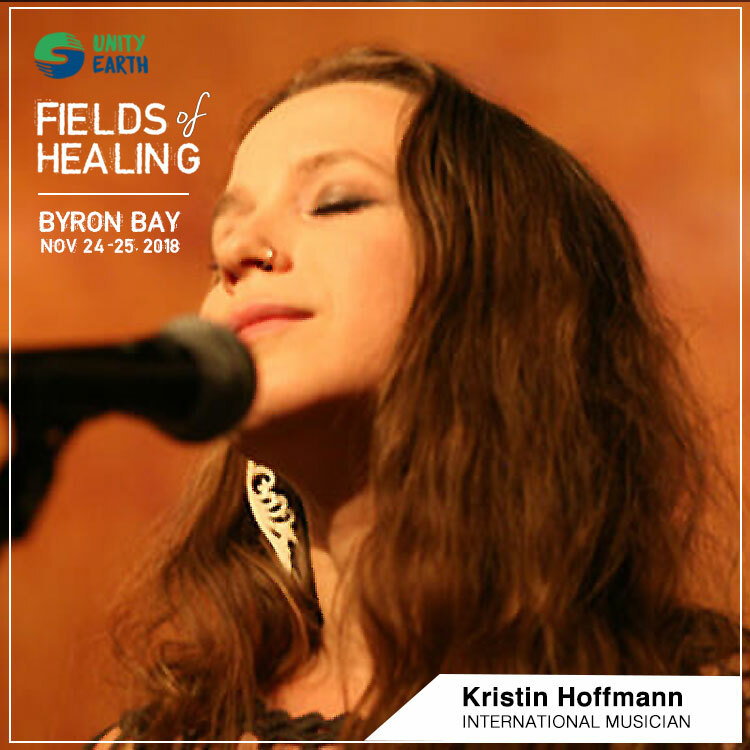 A diverse group of leaders in the fields of regenerative design, social enterprise and circular economy recently came together to discuss opportunities for Fields of Healing 2018 to be a showcase for “ecological healing”, both locally and globally. 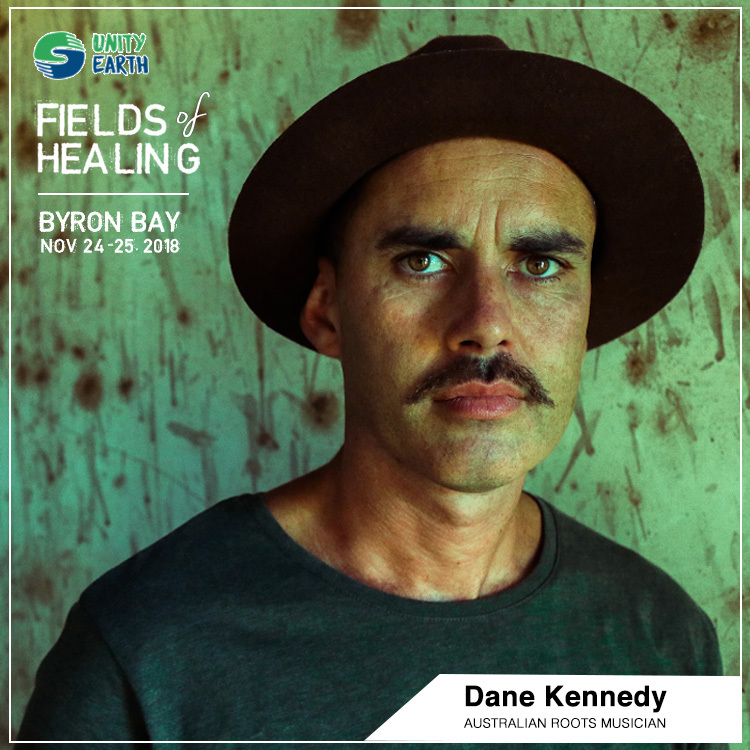 An historic convergence of local and global Indigenous leaders will be joined by a lineup of musicians, artists, healers and sustainability experts for Fields of Healing, a two-day cultural gathering at North Byron Parklands on November 24 and 25. 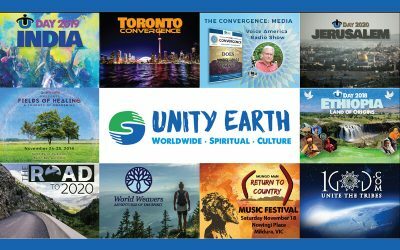 UNITY EARTH is a worldwide collective dedicated to promoting intercultural harmony, spiritual unity, global transformation and peace through music, events and media.